Rodriguez flying fox bats inhabit forests and swamps. Gestation for the Rodriguez flying fox bat takes 140-150 days. 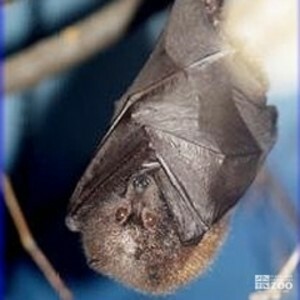 The Rodriguez Flying Fox Bat inhabit forests and swamps, often on small islands near coasts. They normally roost in trees by day, and colonies may utilize the same roosting site year after year. During daylight there is much noise and motion in the roosts, and individuals sometimes fly from one place to another.his range is maintained by constant activity. At dusk they fly to fruit trees to feed. They eat, rest, and digest their food for several hours while at their feeding trees. The principal food is fruit juices, which they obtain by squeezing pieces of fruit pulp in their mouths. They swallow the juice and spit out the pulp and seeds. If the pulp is very soft, like banana, they swallow some of it. They also chew eucalyptus and other flowers to obtain the juices and pollen. They drink while flying to and from the feeding and sleeping locations. Some drink sea water, apparently to obtain mineral salts lacking in the plant food. They maintain a body temperature of 33-37 degrees C. They have a very noticeable characteristic odor. Fruit, eucalyptus and other flowers.